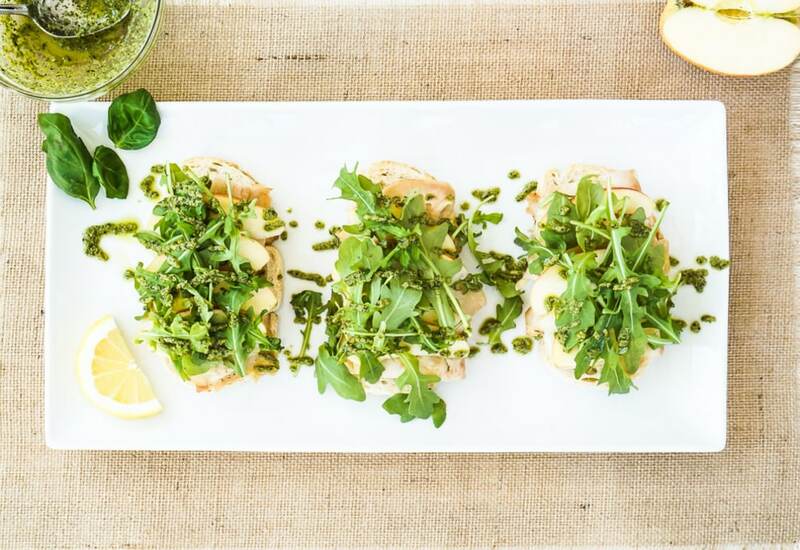 Homemade toasted walnut pesto is the finishing touch on these open-faced turkey sandwiches. The pesto is loaded with basil, Parmesan cheese, garlic and toasted walnuts for a delicious sauce that you'll want to put on everything. To make these tasty tartines, toasted bread is layered with a super flavorful combination of nutty pesto, sliced turkey and the classic pairing of crisp apples and melted cheddar cheese. Topped with peppery fresh arugula, they're like a sandwich and salad all in one dish! They're perfect for an easy lunch or light dinner. To make these sandwiches vegetarian, Simply omit the turkey. Extra pesto will keep in the refrigerator for up to a week, and it also freezes well. Make a double batch to have on hand for future lunches and dinners—toss it with pasta, put it on pizza, or spread on sandwiches! Per Serving: 1248 calories; 93g fat; 49.6g carbohydrates; 55g protein; 184mg cholesterol; 1448mg sodium. This turkey, apple and cheddar sandwich was really delicious, especially with the spicy arugula on top. The walnut pesto was also very flavorful! This is perfect for a quick, light lunch. These turkey sandwiches with apple, cheddar, and pesto were fantastic. I made these for my friend's baby shower and everyone loved them! Perfect for casual parties and get togethers. I like to make these open faced turkey sandwiches after I workout. I use gluten free bread, no cheese, no apple. The pesto is so good! For these sandwiches I just used a homemade basil pesto. I also used an arugula spring mix, so it had baby spinach in it too. The apple and cheddar pairing was delicious, great recipe. Delicious sandwiches, made them vegetarian! The walnut pesto was really delicious, great texture and flavor. The spicy arugula with the sweet apples are such a winning combo too. Toasting the walnuts brought out a great flavor, such a smart move.